The Medallion Signature Guarantees are very much similar to the Notary Stamp which refers to an approval by the transfer agents and signature guarantors that the endorsing individual is the right person to transfer and endorse the relative financial securities to some other parties. The relative procedure of medallion signature guarantee is being excessively practiced and utilised by the securities investment enterprises across the world in terms of ensuring maximum protection to the accounts of shareholders and preventing the transfer of relative financial securities by any unauthenticated and unauthorised person. The guarantee of an individual’s signature is essential before the transfer of financial securities and the transfer agents must ensure the authenticity and validity of the relative signatures before issuing approval to the transfer of respective financial securities. The shareholders need to make an endorsement regarding the transfer and sales of relative financial securities. It may further be perceived by the fact that each and every recorded endorsement needs the signature guarantee through a recognised and authorised guarantor. The relative recognised and authorised guarantors may include brokers, banks and some other financial organisations which are certified and authorised of issuing and releasing medallion signature guarantees. An authorised medallion signature guarantee is a specified imprint stamp involving the use of high security ink in terms of issuing authenticity of the relative signatures. The most prominent uses and applications of medallion signature guarantees exist within the issuance of saving bonds, mutual funds and issuing warrants and other financial securities. Additionally, another most prominent application and use of medallion signature guarantees exist within the stock exchange market. Moreover, the relative signature guarantees are also used by the unit investment enterprises. The medallion signature stamps are being used excessively in terms of issuing clearance to the endorsements of relative transactions. As per the set rules and regulations of the Securities and Exchange Commission (SEC), only recognised and authorised financial organisations are eligible to deliver the services of relative medallion signature guarantees. According to the Securities and Exchange Commission (SEC) regulations, the financial organisations and enterprises which are eligible to provide the services of medallion signature guarantees include domestic banks, credit unions, broker dealers and charitable or trust enterprises. However, the relative medallion signature guarantee may also be issued by the clearing agencies, municipal securities, savings associations and the national securities exchanges. The different levels and requirements of acquiring a medallion signature guarantee involve the presence of all the owners mentioned within the securities and signing the documentations of relative financial securities in the presence of Digital Federal Credit Union (DCU) representatives which are concerned regarding the provision of digital investment services within the region. The Digital Federal Credit Union (DCU) enterprise is concerned regarding the allocation of digital investment services to the U.S. residents only. The documentation requirements in terms of attaining the medallion signature guarantee include a valid ID card with recent photo which may be Driving license or Passport which needs to be shown to the relative DCU representatives. Moreover, a valid proof and evidence of securities ownership also needs to be presented to the relative DCU representatives. Afterwards, the requirements of legal documents are fulfilled which are necessary in terms of completing the transfer of relative financial securities. However, the DCU representatives are restricted to issue guarantee of signatures for worth up to $500,000 or less for each transaction. 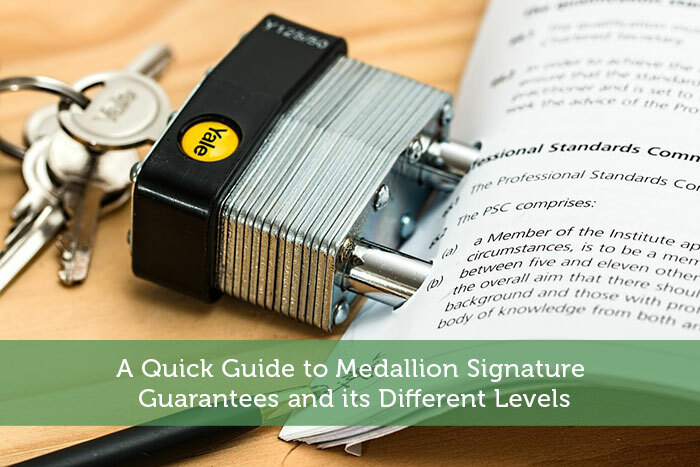 The medallion signature guarantee may be referred to a specified signature guarantee needed in terms of issuing and transferring of financial securities. The medallion signature guarantee ensures the authenticity and credibility of the relative signatures and the financial organisations accepts the liabilities in case of any fraudulence and forgery. Additionally, a medallion signature guarantee also ensures the protection of rights of shareholders and prevents an unauthenticated and unauthorised transferring of financial securities which may impose extreme losses for the investors. The DCU representatives also reduces the limit of the liabilities for the transfer agents who approves an unauthorised documentation of securities. The documentation of relative financial securities needs to be presented to the DCU representatives before attaining clearance to the transfer of relative securities. The role of DCU representatives is of a witness who stamps the relative documentations and performs attestation regarding their presence during the signing of the relative documentation. The transfer agents assist for the medallion signature guarantees as they reduce the limit of liabilities if they perceive the relative signatures to be fake and counterfeit. Hence, attaining the medallion signature guarantees is essential in terms of issuance and transferring of the relative financial securities.